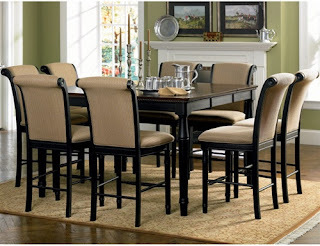 Choose the perfect Dining set for this Holiday Season! The Rich Cappuccino Counter Height 9 Piece Table Set by Coaster is manufactured in contemporary style. 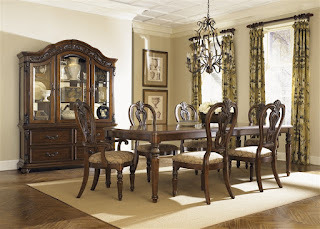 It is crafted from solid hardwoods with the wood veneer top. 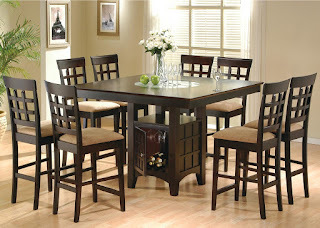 This convenient table includes the storage base with the wine bottle and wine glass holders. There is a frosted Lazy Susan glass insert in the table top, that make this item absolutely unique. 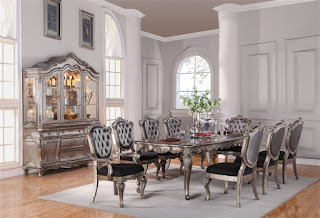 Inviting and majestic, the MessinaEstates Dining Collection by Liberty Furniture will surely impress anyone who steps into the room. 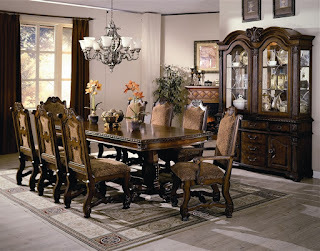 Made of Select Hardwood Solids & Cherry Veneers in Cognac Finish, it features Acanthus Leaf Detail and Beaded Moulding.